July, 2009: Spotlight on Lighting * What are Light Movers? * Dear Simon: Grow Up? "Science, or para-science, tells us that geraniums bloom better if they are spoken to. But a kind word every now and then is really quite enough. Too much attention, like too much feeding, and weeding and hoeing, inhibits and embarrasses them." 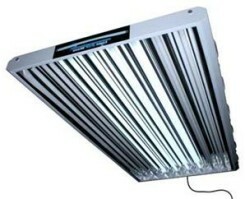 The most ideal light for your hydroponics garden, of course, is sunlight. So far, no artificial lighting can truly match the quality or quantity of light produced by the sun. So outdoors is truly the best. So what do we do? We compromise! We hang special lamps above our indoor hydroponic gardens to provide the best possible artificial lighting for those crops. In the earlier days of hydroponics, fluorescent lighting was about as good as you could get. "Gro lights" or "Gro Lux" lamps were available which provided high intensity cool-white fluorescent light. Fluorescent lights burn very cool and are still fine for non-fruiting, non-flowering specimens. We use T5 fluorescents (latest generation) exclusively for our lettuce rafts, with great success. Today, plant lights are much more sophisticated and closer to the spectrum and intensity of sunlight. Most lights sold for hydroponic gardening are high intensity discharge (HID) lamps. Further, there are two types of HID lights: high-pressure sodium (HPS) and metal halide (MH). The best lighting is a combination of HPS & MH, each one used at different times in the growth cycle. HPS lights provide more of the red-spectrum rays, which promotes fruiting and blooming. MH lights are more in the blue range, which causes rapid growth (early phase of growth). Commercial greenhouses use a combination of both HPS & MH at the same time, but this is very hot and expensive, and not practical for the hobbyist growing in his home. If a choice must be made, go with a MH light for indoor use, as it has a wider spectrum of light and is better suited for "all-purpose". Now they have available a "conversion lamp", which permits changing out of the bulbs, using the same lamp, fixture and ballast. This is what we use, and have been very happy with. You want a minimum intensity at leaf surfaces of the upper parts of plants of 5500 lux (510 foot candles) for 14-16 hours per day. HPS bulbs come in 150, 250, 400, 430, 600 and 1000 watts, while MH come 175, 250, 400, 1000 and 1500 watts. That being said, I'm going to bend the rules now. First of all, I gotta tell ya, 1,000 watt lamps are HOT! We almost always use a 4X4 footprint garden of mixed veggies, and have used 400 watt MH, interchanged with 400 watt HPS, with good results. But if you want to give yourself the edge, and are heavily into tomatoes and other fruiting crops, you could get a 600 watt HPS and go with that exclusively. P.S. If you have a "double garden" of 4X6 to 4X8 foot, get two 400 or 600 watt lamps instead of one 1,000+ one. So have we confused you thoroughly now? Hope not. Start newly transplanted seedlings immediately with the HID light. Start them out at 3 feet above the plants so you don't cook them, then lower the light about a foot a week until it is one foot above the tops of the plants. Now you reverse the process, raising up about 6 inches as the plants grow 6 inches. conditioning is a must in hot climates. A hot lamp on a hot patio spells disaster. Trust me. The lamp itself will come with a reflector of some sort. Some folks rave about their "parabolic" or "conical" reflectors, but we can't comment on them, having never tried them. We use the boxy "horizontal light reflectors" shown below, and really doubt there is a whole lot of difference in intensity or performance in the different reflector shapes. If your grow room is suitable, you can definitely increase the light reaching your plants by covering the walls with reflective Mylar, or white plastic sheeting, which bounces lost light back to the plants. So What Is A Light Mover? Want a cadillac grow room? Get a light mover. This device moves your lamp back and forth above the garden for more even light distribution. This promotes more even growth and prevents burning of leaves. Note: they do not allow you to get by with less wattage, they just distribute it more evenly. 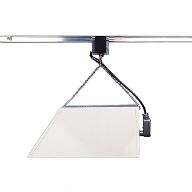 Linear light movers work on tracks 2-6 feet long, the lamps travel about 2 feet per minute. These work best for long, narrow growing areas. There are also circular, revolving movers for more square growing areas. Light movers are not that expensive but do require a sturdy surface (ceiling beams or a framework) to mount them on over the garden. Love your site, keep up the important and informative work. Could you please offer me advice on growing vertically or making a vertical system? I would like to grow plants or vegetables in 6-10 " diameter pvc pipes that are vertical. Can I just drill holes in the sides of these and place grow cups in them? Thanks for any direction and help! Thanks for your kind word about our site, and we are just getting started! I'll be honest with you, we have never tried vertical growing systems. Hydroponics is cool, though, in that you can actually do your own thing, and if it works, then why not? Experiment with your pipes and see what works. I do know that when you use pipes and a flowing nutrient kind of setup, it can get a little tricky. The solution must flow continually over the roots so they don't dry out, but not too fast. Also, roots tend to grow and can clog the tubes. That being said, I know there are plenty of people doing the vertical thing with pipes, so go for it! Good luck, Greg, and thanks for visiting our site!